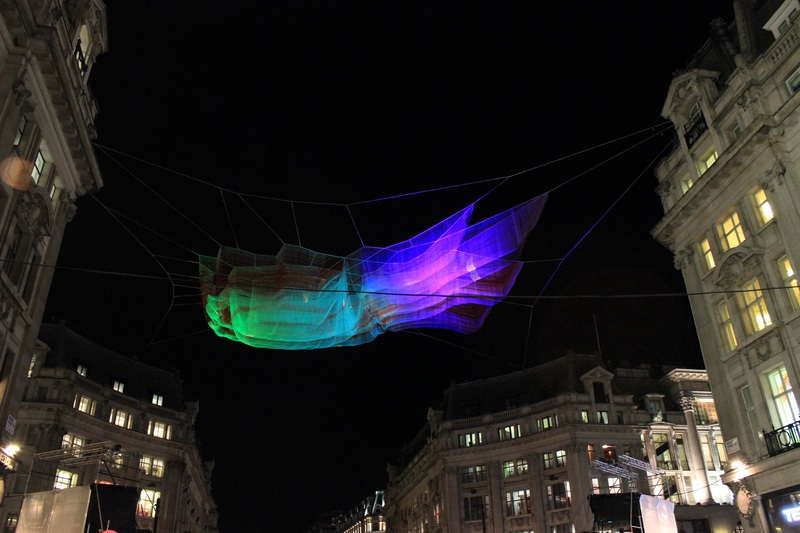 Last week my sister and I went along to Lumiere London, an event being held over 4 days showcasing 30 light art installations across Central London. This is the first time such an event was held and as it was free and practically on our doorstep we decided it was too good to miss. Armed with our cameras and special maps pointing out where each artwork was placed, we got going, ready for lots of walking and snapping. The first area we walked through was Mayfair. Here there were a couple of pieces I liked, my favourite being the phonebox converted into a fishtank – which I thought was so innovative and clever. Unfortunately it was really busy and difficult to get a good picture, but below is my best one to give you an idea. It was an interesting piece and the various changing colours and textures kept our attention for as long as we could see it. Other lightworks around Regent Street that we saw included a stickman show, a lovely trumpeting elephant and a pretty, colourful, luminous dress. I also enjoyed watching the flying ‘fish’ which were set against the backdrop of tall white buildings and the dark night sky. As we worked our way through the London street we took in the colourful, pretty lights, the buzzing atmosphere and the upbeat music, and although it was a really cold night we were glad to be there. I still have more photos of the remaining 2 areas; Trafalgar Square and Kings Cross, both of which also held some lovely innovative pieces which I will post soon.